Sponge cake is something I fear the most among all kinds of cakes. Sometimes when I have luck I can get a tall and spongy sponge cake but sometimes my sponge cake is short even though I use the same recipe. I chanced upon this recipe from 君之blog, a famous Chinese food blogger when googling and so far this recipe give me consistent result. Beat egg whites till frothy, add sugar in 3 additions and beat till soft peak. In a separate bowl, beat egg yolks and sugar till lighter colour, add melted butter and vanilla extract, mix well. Fold in 1/3 of meringue to egg yolk mixture and mix well. Then return the mixture to meringue, fold in using a rubber spatula. Sieve in flour and fold in using a rubber spatula. Pour into prepared pan (I used two 6” round pan), bake in preheated oven ay 175C for about 30 mins (for my 6” cake). The height of my cake is about 6cm. Since I used loose-bottom pan, I didn’t grease or line the pan with baking paper. You may add ½ tsp of baking powder to the flour. For chocolate flovour, just replace 26g of flour with cocoa powder. i'm keeping this recipe. thanks! Angel, I haven't baked sponge cake before. I must try this recipe! This recipe is great for beginner. Angel,is the sponge moist? Does it drys out a lot after u place in fridge? Tia! The amount of fat used in this recipe is relatively lower, so this sponge cake isn't very moist but rather "spongy". Thaw in room temp for a while before eating the cake will return the original softness. 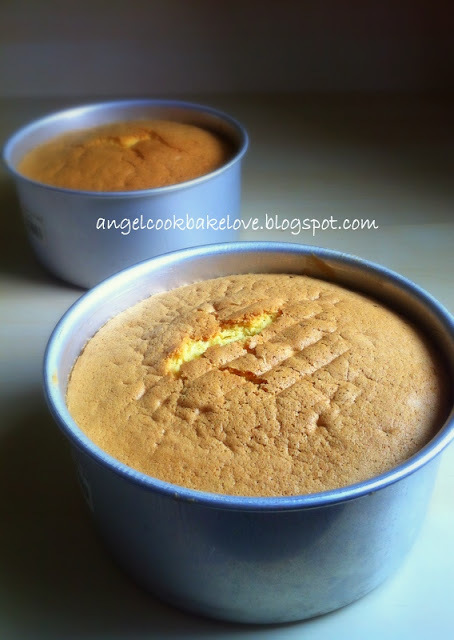 What is the different between sponge and chiffon cake ? 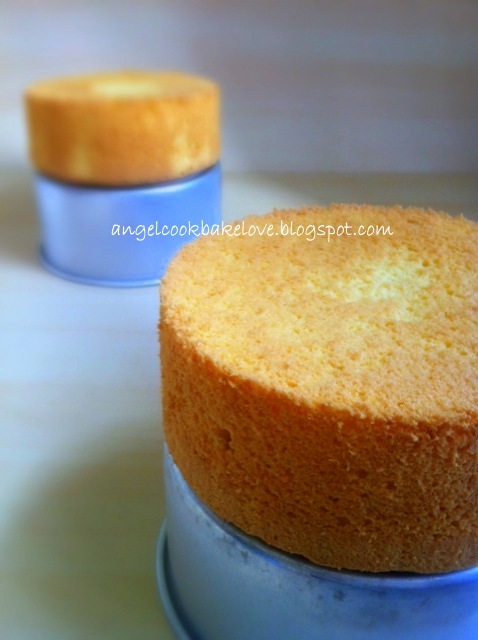 Chiffon cake has higher liquid contents and it is usally softer. It is made using egg separation method whereas sponge cake can e made using whole egg or egg separation method. It is firmer which make it more suitable for layer cake. Hi Angel, do you think this cake can bake into multi layer rainbow cake? Will it be deflated when mix in food color? If your oven can bake all at one time I think it's fine to divide the batter and mix colour. However, if you are going to bake in a few sessions I think it is not advisiable. You probably have to prepare the batter separately. What is the size of the egg? Usually I use 60g egg (A size) for my bakes but this recipe specify medium eggs so I use 55g egg (B size). What is the egg size? Also, I have a sponge cake recipe that is very nice and I got it from a baking class. I have tried more than 20 times and yet to succeed ... I don't know what is wrong. As u are good in this, would u like to try out and let me know if you can do it. If u are keen, drop email me at leia3zillion@gmail.com. Can I replace butter with oil. I like oil as it gives lighter texture. Yes. You may relace butter with oil but butter gives the cake better aroma.